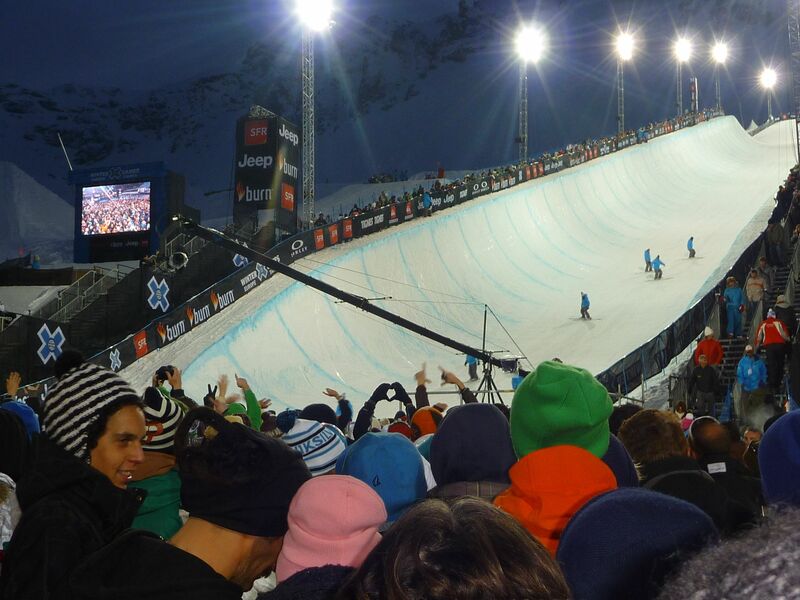 The thought of going to the X-games is exciting enough, but actually being there was a whole other experience! After a 4.30am wake up call we made our way to the X-Games. Tignes, A well facilitated resort flanking it’s big brother Val d’Isère, France played host for the second year in a row. It was cold and I was blasy blasy from the evening previous from enjoying waaaay too much scotch and music (as you do!). It was puking with snow, and It wasn’t long before we strapped on our boards to head up and explore the infamous Tinges resort. The snow was fresh and powdery around the summit, and tracked out and sticky below. Limited visibility making it a challenging ride! Satisfied with our morning’s adventure it was time to check out the action of the X-Games. It was already in full swing with 2 days of pre-qual and quals warming up to the finals. Today was all about the men’s elimination for Snowboard Superpipe, and womans Snowboard Superpipe final with some Slopestyle also.. Random weather conditions fluctuating throughout the week was proving difficult for the riders and organisers. After a rider vote, they decided to forgo the elim round for men’s Slopestyle, in favor of running the comp as a finals-only when the weather was supposed to be a bit clearer the following day. Kelly Clark, a renowned Superpipe champion took out the title (yet again!) with a frontside 720, Cab 720, frontside 900, backside 540, frontside 540. The nine-time Winter X SuperPipe medalist has won 10 out of the 12 pipe contests that she entered this year. This chick has serious steez! Despite the heavy snow and thick fog, the Superpipe was still a massive highlight. We had a good spot in the crowd pit at the base of the pipe cheering the riders on as they dropped and hit the coping. I tell you what tho.. It’s kind of bizarre listing to the commentary in French.. Actually everything was in French, including the programme.. You can make out some of the words using common sense (and a French speaking mate), but otherwise it was quite an arduous task keeping track of what was happening due to the language barrier.. Nothing like a good challenge I say! During this time we were back and forth to the car getting more clothes and topping up the hipflask (so high school, but so good!).. It was cold! I was wearing almost every item of clothing I brought and stayed in my snowboarding boots for the duration of the event. After the Superpipe Pre Quals were done, it was time to hit the main stage where 2 Many DJs were due to perform a free concert. The stage set up was awesome. There was a massive PA flanking a large stage. The DJ booth was wrapped in a mini gazebo, sealed in. It’s the most fanciest, yet functional DJ set up i’ve seen for outdoor use. Mainly (I guess) so the super-star Djs wouldn’t get cold.. Isn’t that nice! There was a support act, but not sure who they were.. They played a deep-tech-house set that was cool, but a mere unsatisfying appetizer for the main event. Belgium duo, 2 Many Djs then tore it up with a massive free concert rocking out their signature ‘mash up’ style to 10,000 + raving snow lovers. Crowning moments of their set was not only their epic music, but crowd surfers and chicks on shoulders getting branded with snow-balls. It started with a couple of guys surfing the crowd on a toboggan that made attractive targets, but it then became a game to see how long you lasted on someones shoulders before you got bombed off your post. Hilarious!! I wish I had that on film. After 2 Many Djs, the town of Tignes was alight with parties, people and action.. People dispersed in all directions and wasn’t long until all the bars were flooded with amping party people looking to kick on.. We found ourselves at a bar called ‘Blue Bar’ which was playing some very funky, jump up DnB. We also checked out the Oakley gig, which was a rather exclusive affair with The Nextmen playing.. Are we having fun yet? I think so! Finals day and it was Blue Bird! Half a meter of fresh had blanketed the resort. Massive bonus for the riders that were actually able to see the Slopestyle course that was the cause of much unrest throughout the event. Taking out the title and hailing from the USA, Chas Guldemond’s best run ended up earning him the highest score any slope rider in any X event has ever earned: A 99.33 for a backside 270 on the down rail to double back rodeo to cab 270 to back lip fakie to a cab double cork 12 and back double 10 over the last two kickers. Nice work bro! I couldn’t resist and have to go out to go out for a couple of runs and managed to score plenty of fresh to appease my riding appetite, then it was time for Snowboard Superpipe mens final. There was some tough competition with last years champ ‘I-Pod’, Christian Haller, and crowd favorite Louis Vito all aiming for gold. Louis Vito’s hard work during the season payed off honoring him his first ever X-Games medal in first place. With every hit, the crowd of more than 22,000 people cheered him on. Vito threw a double crippler to Michalchuk to frontside double cork 1080 to cab double cork 1080 to frontside 1080, moving him into first place with a 93.00 score. Vito has included three doubles in his runs for a while now, but Friday night he boosted them just a little bit higher which obviously impressed the pants off the judges. All in all a seriously epic event (and i’m not exaggerating!!) Lots of action, world class facilities, world class competition, all driven by an organiser determination to make the European X-Games 2011 one of the best yet for riders and spectators alike.. And all FREEEEE!! Massively awesome.. Rad to the max!